Chancellor’s Council members are invited to attend the Annual Meeting & Symposium held each spring, usually in late April or the first Friday in May, which includes the Chancellor's “State of the System” address and features presentations that focus on innovative programs and dynamic works at UT System institutions. Members may also receive special invitations to events with the Chancellor and key administrators, including opportunities to attend enriching activities both on and off campuses. 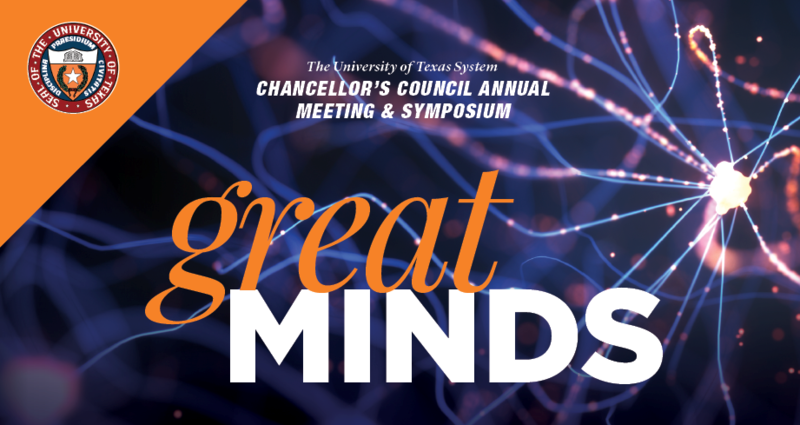 The 52nd Chancellor's Council Annual Meeting & Symposium will be held on Friday, April 26, 2019 at the Frank Erwin, Jr. Center on the UT Austin campus. Visit the 2019 Annual Meeting website for more details. Panels featuring experts from UT institutions delved into hard-hitting questions that many people across the nation also are asking: What is the value of higher education, and what are universities doing to make sure students get the support they need to ensure they graduate? Chancellor’s Council members learned it’s more important than ever to increase the number of college graduates living and working in Texas, not just for the state economy but to maintain America’s competitiveness in the global economy. Furthermore, the basic research that is cultivated at institutions of higher education is what leads to new technologies, new discoveries and new medical treatments that everyone – whether or not they ever step foot on a university campus – benefits from. And in Texas, the future is now, demographically speaking. As the state changes, so do its students, bringing with them a new set of experiences, strengths and challenges. The path to – and through – college looks very different for today’s students, and to help them succeed, UT institutions must be student-ready as much as students are college-ready. UT institutions are on a mission to reimagine the path to student success. Visit the 2018 Annual Meeting website for photos, videos and a recap of this special day. Council members celebrated a journey a half-century in the making, commemorating 50 years of coming together to advance education, research and health care across Texas and the world. The 50th Chancellor's Council Annual Meeting and Symposium was held on Friday, April 28, 2017 at the Frank Erwin, Jr. Center on the UT Austin campus. Visit the 2017 Annual Meeting website for a recap of the special day. On Friday, members of the CCEC and Chancellor's Council joined together to discover how The University of Texas System and the 14 UT institutions are leading the way in addressing the most significant challenges of our generation. Reimagining health care delivery and medical education. 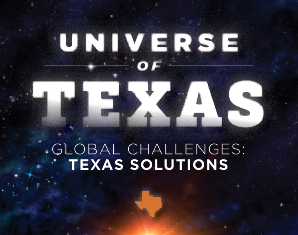 If there's a global challenge, there's a Texas solution. The day reserved for honoring the life-changing and world-alerting research and initiatives developed at UT institutions drew close to 1,000 donors, many of whom first attended the Spring Business Meeting. When it comes to fighting cancer, protecting the world from cyber threats or outsmarting an outbreak, UT institutions have got "the best and the brightest" on the job, Chancellor Bill McRaven stated in his State of the System address. That's why we truly are the Universe of Texas. At University of Texas institutions across the state, a Texas-sized spirit fuels intense curiosity. It's a relentless drive that spurs innovation in the way we teach, conduct research and deliver health care. At the 47th Chancellor's Council Annual Meeting & Symposium, Chancellor's Council Members and special guests learned how UT institutions are harnessing the power of innovation. Visit the Annual Meeting website for excerpts and videos. More than 800 Chancellor’s Council members joined Chancellor Francisco Cigarroa and met four all-star alumni whose UT educations have left an indelible brand on their lives and enabled them to make a profound impact on the world.